This topic explains the numerous adjustment possibilities provided by the options window. Options form is available from the toolbar, pressing Edit Options button, or from the main menu Tools->Options. A knowledge of the options and their meaning is particularly important to solve problems and to adjust the program to your needs. 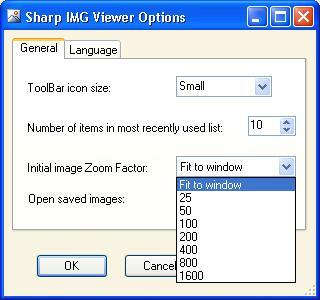 This option allows to set icon size of toolbar buttons to small or to large. This option defines the maximum number of items in most recently used list available by selecting File->Recent Images submenu or Open Image toolbar button. This number can very from 0 to 99. Old image files are replaced by newest one, when the number of items exceeds the number of items. This option specifies how to fit the opened image to the working area. This option if checked instructs to open the image after saving and display it in a new tab page.